Mercedes-Benz is continuing the revision of its entire crossover lineup with the introduction of the new GLS. A facelifted version of the existing GL-Class, the new GLS aims to serve as the flagship of the German automaker’s SUV lineup in the same way that the S-Class does for its sedans, coupes, and convertibles. As an update (rather than a completely new model), the new GLS is physically mostly the same as the GL it replaces, but packs a comprehensive series of revisions to bring it up to date. Those revisions can be seen on the outside, with revised styling front and rear. However the real changes have been made underneath the skin. The seven-passenger interior features a new three-spoke steering wheel, instrument panel with media display, center console with touchpad control, ambient lighting, and even an available air ionization system. The interior trim has been redone as well, with available Designo Exclusive and AMG Line packages to individualize it further. The new GLS will be offered Stateside in four engine specs. The base model is the GLS450, with a 3.0-liter twin-turbo V6 producing 362 horsepower and 369 pound-feet of torque. Step up to the GLS550 and you get 455 hp (20 more than before) and 516 lb-ft of torque. There’s a six-cylinder diesel option in the GLS350d, good for 255 hp and 455 lb-ft. And the performance flagship, of course, is the new Mercedes-AMG GLS63, with 577 horsepower and 561 lb-ft of torque. The standard versions come with 4Matic all-wheel drive and a nine-speed automatic transmission with additional settings. The AMG version gets a rearward-biased traction system and a seven-speed dual-clutch gearbox instead. The standard models ride on an improved air suspension with enhanced damping, but the GLS63 adds a Sport+ instead of Off-Road setting on the Dynamic Select controller. There’s a low-range gearbox and locking center diff available as well for those who plan to go off-road. 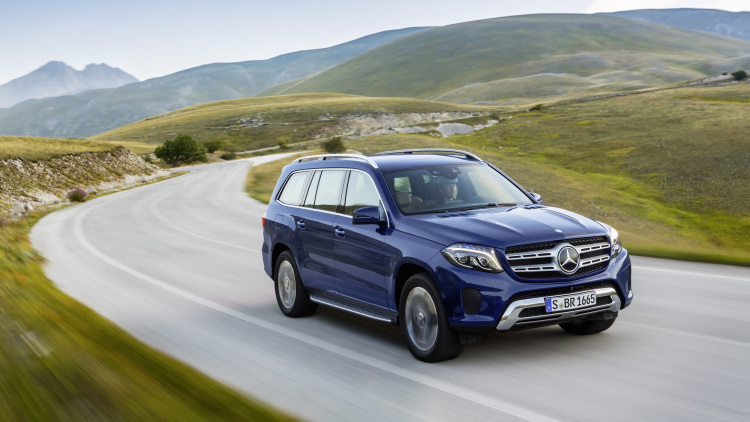 Mercedes has fitted the GLS with all its latest electronic systems, including Collision Prevention Assist Plus, Crosswind Assist with Attention Assist, Brake Assist BAS, Pre-Safe braking, and more. The optional Driver Assistance package adds Distronic Plus with Steering Assist, pedestrian detection, cross-traffic assist, active blind-spot monitoring, lane-keeping assist, and more. There’s an optional intelligent LED lighting system and heated adaptive windshield wipers as well. The bottom line is that the new GLS brings a more refined, efficient, and safer package to the top of the Mercedes crossover range. The order books open at US dealers in December, with deliveries to commence late next March.